At Pacific Terrace Apartments, we are so excited to announce that we are renovating! 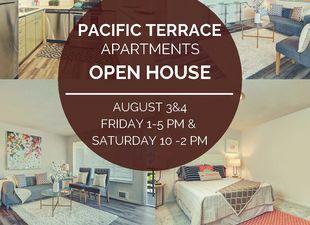 Join us on Friday August 3rd from 1:00 P.M -5:00 p.m and Saturday August 4th from 10:00 a.m- 2:00 p.m at Pacific Terrace Apartments in Tacoma for open house and the reveal of our first upgraded model unit! Meet with our management staff to learn about all of the exciting new projects taking place at Pacific Terrace Apartments! Snacks and beverages will be supplied in celebration! We hope to see you there!